Let's give your dinner crew something to taco-bout. 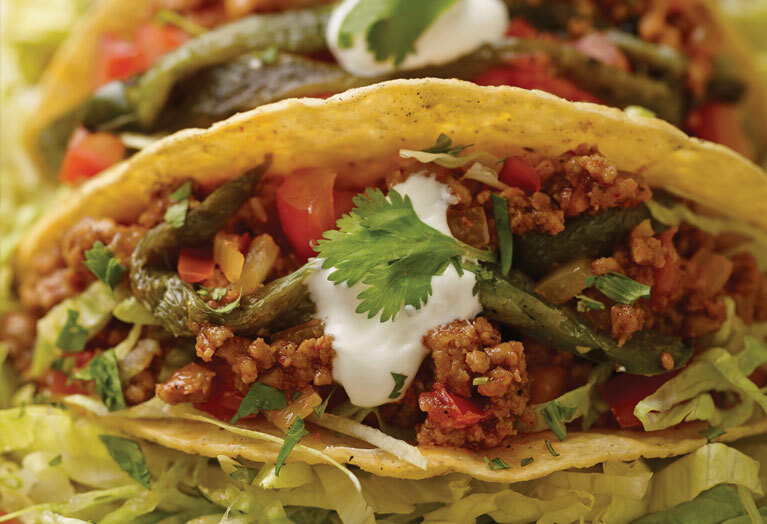 We're willing to bet that a double or even a triple batch of these Southwestern Veal Tacos will transport your guests south of the border, thanks to chili and adobo-spiced ground veal that's packed inside crunchy shells and finished off with classic toppers like cheese, lettuce, tomatoes and sour cream. Taco-riffic! Heat oil in a large sauté pan. Add the ground veal, chili powder, cumin and adobo spice and cook until lightly brown. Add the onion and garlic and continue to cook until the vegetables are translucent. Add the diced tomatoes and continue to cook on low heat for 2 minutes. Season with the piloncillo, chipotle, cilantro, lime juice, salt and pepper. Sprinkle in the masa harina and cook for another 3 minutes on low heat to thicken the mixture. Set aside. To assemble the tacos, divide the taco meat into 8 taco shells, about 1/4 cup per shell. Sprinkle on cheese and roasted peppers. Place tacos in the oven for 5 minutes or until the cheese is melted. Top with shredded lettuce, diced tomatoes and sour cream. 123 mg cholesterol; 5 g fiber.